BelarusDigest > Myths > Is Healthcare in Belarus Free? Is Healthcare in Belarus Free? Officially health care is free in Belarus. However, an ordinary Belarusian very often cannot obtain even basic services free of charge. There are some segments of the health care system where people do not have to pay. That includes staying in a shared hospital room, birth delivery, vaccinations etc. Emergency care is free, but medical services beyond that such as dental care are provided at an acceptable level only at an extra cost (legal or not). However, even for these services it is usually recommended to give health care workers something to make them 'look after you better'. Though deemed a form of bribery, the widespread illegal pay or official fees for health workers encompasses all levels of public health – from a nurse administering injections to top specialists consulting on complicated cases. Very frequently it is not money, but some precious gift, like expensive cognac. The health infrastructure is a remnant of Soviet times, and was neither built nor developed by Lukashenka's regime. On the contrary, his governments have gradually been reducing the social achievements of the Soviet times. At the same time, there are a number of private clinics in Minsk where services are offered at a good standard, using modern equipment. 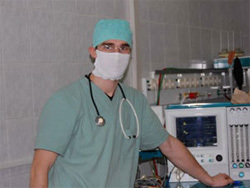 Costs for such services are paid out of pocket, because the system of medical insurance is underdeveloped in Belarus.